If you are interested in learning more about the NVIDIA Turing technology and what you can expect from the performance of the new graphics technology. 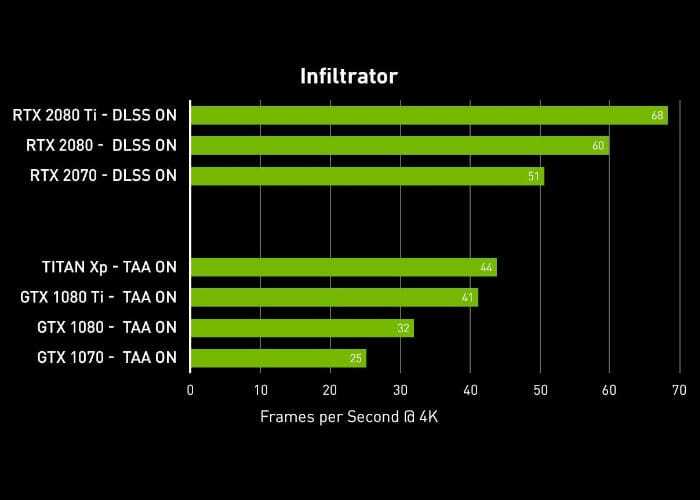 You’ll be interested to know that NVIDIA has today released comparison benchmarks for its new AI-accelerated DLSS technology. Deep Learning Super Sampling, or DLSS, allows Turing to generate some pixels with shaders and imagine others with AI. “Turing combines next-generation programmable shaders; support for real-time ray tracing — the holy grail of computer graphics; and Tensor Cores, a new kind of processor which accelerates all kinds of deep learning tasks, NVIDIA CEO Jensen Huang told a crowd of more than 3,000 at the GPU Technology Conference in Europe this week.” Check out the demonstration video below. For more information on the comparison benchmarks for its new AI-accelerated DLSS technology jump over to the official NVIDIA website by following the link below.